Invisalign is likely the greatest advancement in dentistry in my 30-year dental career—but like anything great, it has nuances that need to be fully understood. If you’ve been discussing Invisalign with your dentist, or even just researching it on your own, you likely have a lot of questions. This guide will explore everything you need to know about Invisalign—from whether it’s actually invisible to how well it works to get the results you want. Invisalign is a method of straightening teeth that, unlike braces, has made its name in the industry for being “invisible.” Invisalign isn’t completely invisible, though. It is, however, a functional and aesthetic option that uses incremental transparent aligners to straighten and realign teeth without the obvious physical appearance of braces. It is, in many cases, an aesthetic improvement over conventional braces. See the bubbles on these aligners? That’s where the attachments on the teeth fit, which aids moving the teeth. Choosing Invisalign is primarily a lifestyle choice due to the advantages of aesthetics and hygiene. Aesthetics. : You get clear liners that are nearly invisible compared to conventional braces. Speed. : Often, some Invisalign cases can be quicker than conventional braces by nature of the design since they can move many teeth at once. Comfort. : There are no wires and sharp corners like with conventional braces. Results. : Invisalign can move teeth in ways braces cannot. Reduced risk. : With Invisalign, there’s less risk of shrinking of teeth roots due to the excessive force that can be applied with conventional braces. Time savings. : There are fewer dental visits than conventional braces. Better breath. : It is almost impossible to completely clean around conventional braces which leaves you with “braces breath.” With Invisalign, you can remove your aligners completely to floss and brush normally. There’s also less risk of gingivitis and hyperplasia (gums growing up over the brackets) because you are able to clean your teeth better. Help TMD: Invisalign can help relieve myofascial and TMD symptoms. If worn 20 hours per day, the liners act like a splint to potentially relieve pain. 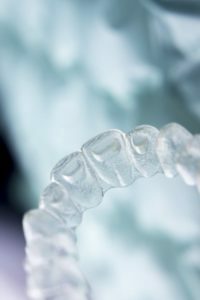 Aligners to keep for life: Your Invisalign aligners can double as whitening trays or a mouth guard during and after treatment.